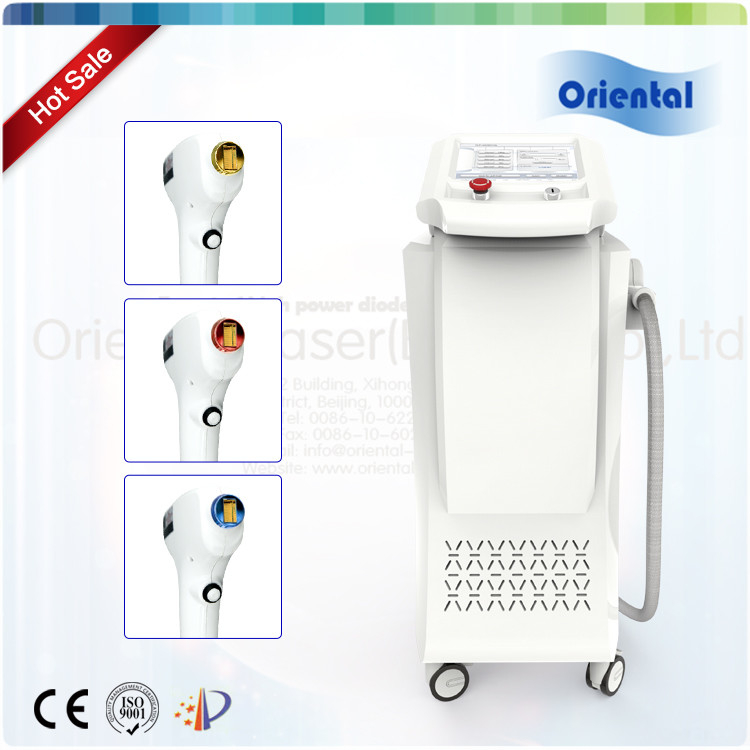 This is a multi functional 808nm diode laser hair removal and skin rejuvenation machine for all skin types. 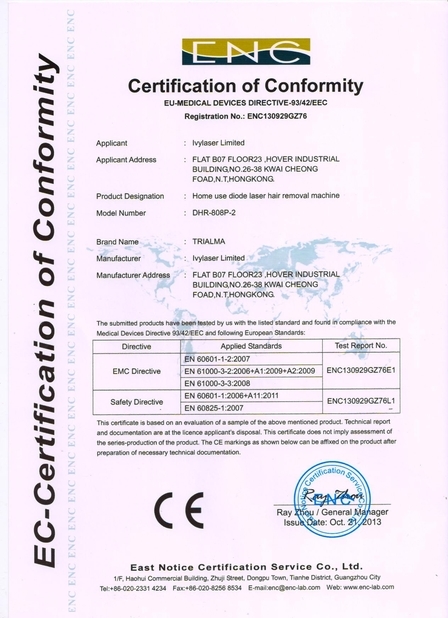 It is new launched in 2016 by Oriental-laser (Beijing) Co,. 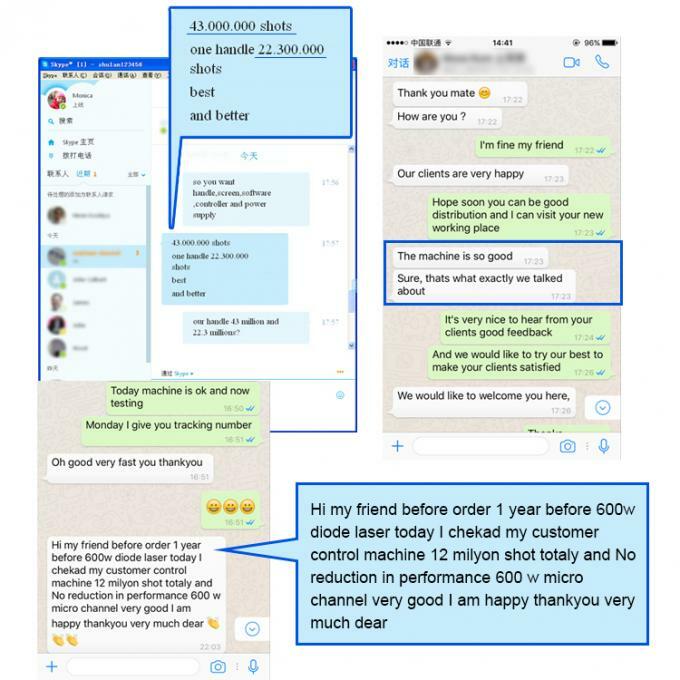 Ltd. We have made some program improvements on the basis of the former best seller 600W micro channel systems and we promise it will perform better than before. The 808nm laser light can be absorbed by melanin the hair shaft and hair follicles, and then converted into heat, thus increasing the hair follicle temperature. The hair follicle structure will be irreversibly damaged when the temperature rises beyond a certain point, and the damaged hair follicle will disappear after a period of natural physiological processes, thereby achieving the purpose of permanent hair removal. 808nm diode laser hair removal is suitable for any unwanted hairs on all areas like face, arms, armpits, chest, back, bikini, legs and etc. It is also with skin rejuvenation functions at the same time. 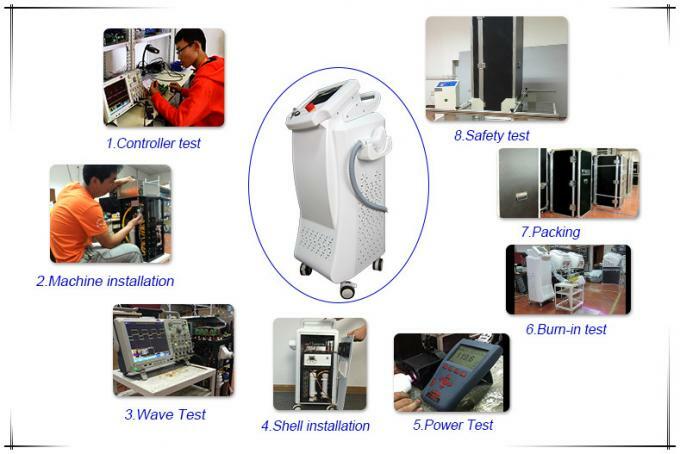 This machine power consumption will be more than 2000W for no pigmentation and excellent treatment result. You see it can penetrate the can surface and drop on the board with glaring spot. Oriental-laser used best quality Germany imported diode laser bars and micro channel cooler,and our engineers are with more than 16 years diode mounting and assembling experience,so the laser handle diode never burn except life span over. This new diode machine will use also the same 600W micro channel configuration but with program improvements and software updated. Why is the price lower than before? We will launch it as hot sale product and now are during pre-sales period and will uniform delivery on October after orders more than 100sets. Oriental-laser is professional diode laser machine manufacturer with experienced engineer working in class 10 and partial 100K class clean lab. Also our diode machine is assembled from zero to ten,you can enjoy the following machine assembly process. 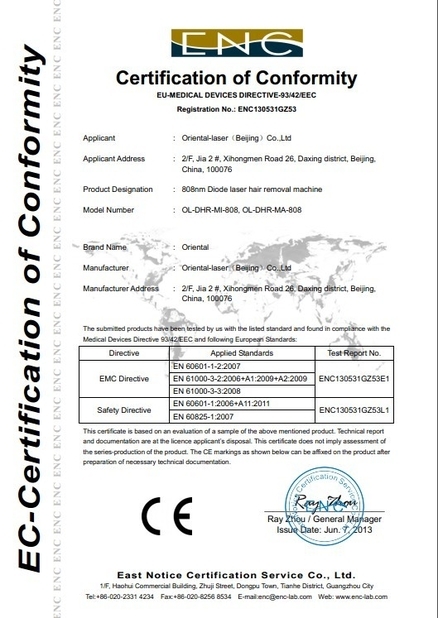 Oriental-laser has more than 16 years of diode laser bar assembling experience.We imported Germany Jenoptik diode bars and also micro channel pieces from another famous brand.Also we have partial 100K class and most 10K class clean lab here in China main office. Then the specialized engineer will mount the diode laser bars on diode stack and assemble it into handles.After checking and testing,the machine will be finished totally.